James Thomas Byford McCudden VC, DSO & Bar, MC & Bar, MM (28 March 1895–9 July 1918) was an English recipient of the Victoria Cross, the highest award for gallantry in the face of the enemy that can be awarded to British and Commonwealth forces. McCudden was the most highly decorated British Empire pilot of the First World War and one of the longest serving, having joined the Royal Flying Corps in 1913. McCudden's story is all the more remarkable as he rose though the RFC ranks (from Air Mechanic to Major) during the war to become one of the most decorated soldiers of the conflict. At his death he had amassed 57 victories, making him the seventh highest scoring ace of World War I.
McCudden was one of the first truly 'professional' airmen, who applied a scientific approach to air combat. McCudden took great pains over his guns, aircraft, and tactics, dismissing choices of last resort such crashing your plane into the enemy just to get a kill. Using his knowledge as a mechanic, he effectively supercharged his aircraft to give it an additional 4000ft altitude ceiling. This resulted in him specialising in carefully stalking high altitude reconnaissance aircraft, leading to an unsurpassed total of captured enemy aircraft kills (21 fell within Allied lines). Some of these stalking techniques are described in McCudden's autobiography, entitled "Flying Fury - Five Years In the RFC". I'm not an expert on kit origins, but this one looks surprisingly like the Roden kit. 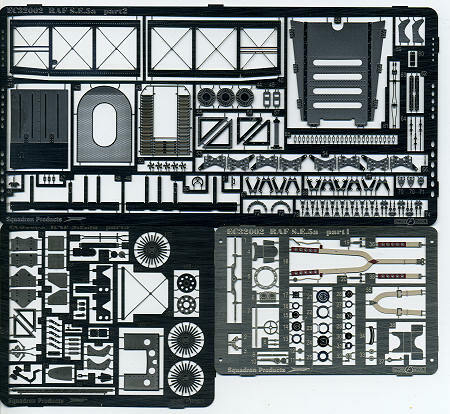 However, you get a ton of additional goodies in photo etch (three frets) and a number of resin bits that will allow the builder to do a very accurate aircraft. Though not specifically marked as such, I've a suspicion that the photo etch is from Eduard. However, it may not be as the side of the box states that parts of the kit are from Ukraine and Italy, which does cover the kit and decals. 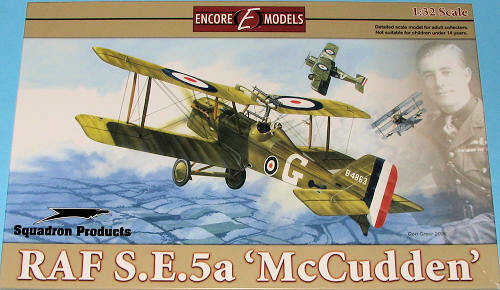 Regardless, the choice of a kit is a good one as Roden kits are very well done and their SE5a is particularly nice. I was taken by how well done the fabric detailing is on the wings. The effects are quite subtle as one would expect on a plane that has been sitting out in the sun and allowed the fabric to tauten up. 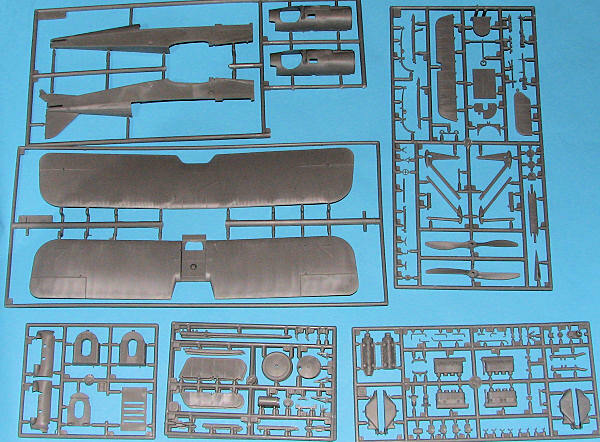 As with most WWI aircraft, the changes during its construction life are considerable and so there are a number of optional parts on the sprues, including props, engines, landing gear, radiators and the cockpit surround area. The biggest complaint about the Roden kit from reviewers has been the lack of cockpit detail. Well, that has been taken care of in this kit with the inclusion of three photo etch frets, including one that has color parts for the cockpit and seat harness. In addition, there are a number of resin bits. McCudden's first S.E.5a had a modified cockpit area that was broader than the norm. This and a more detailed cockpit section are included in resin. Also in resin are two props. One standard four blade prop and one with a spinner. Resin is also used for a number of other bits, including a new radiator mount. This is to allow the superb photo etch radiator grille to be used if the modeler wishes to. Resin is also used for the exhaust and the wing inspection plates. Basically, one can built any of two aircraft in three different liveries. First is the 'early' aircraft of his from 56 squ adron prior to 23 September 1916. This has the large letter G and the 'dumbbell' marking used by the unit and is shown on the box art. This same aircraft can be marked as it was after that date when the rear fuselage marking was replaced by a white band. This particular aircraft had the enlarged cockpit area and the single strut landing gear. The third marking option is his second aircraft. This has the strengthened double tube undercarriage, a standard cockpit and a large red spinner taken from an LVG that McCudden shot down in late 1917. This aircraft replaced the G with a number 6. Decals are by Cartograf so are superbly done and will be quite opaque. There is a bonus in terms of a 1/32 resin figure of McCudden (not shown), which adds considerable interest to the kit. The instructions are top rate. They are in full color with superbly drawn construction illustrations. There is a very large section that is devoted to applying the various bits of photo etch to the kit. One can build this without using the p.e., but really, it is silly not to use it as it will enhance the detail level of the kit and you are paying for it anyway. These pages will show exactly what needs to be removed or modified to use these parts. The number of parts is quite extensive and covers virtually every aspect of the airframe. Finally, there is a complete rigging diagram with some of the rigging shown in color so you can clearly see what goes where. It seems like the folks at Encore have really done their homework on this one. You get a super kit with all of the aftermarket bits you'd ever need all in one package. When you consider the MSRP of the kit and then add in the cost of all the resin and photo etch, it really does turn out to be quite a bargain. Plus you get known good decals in the mix. How can you go wrong? My thanks to Squadron Products for the review sample. Get yours at your local retailer. I know the LHS sold out of theirs very quickly.